LOVE picture of kids looking out of a window!! Look at all that snow too...ugh, c'mon SPRING! 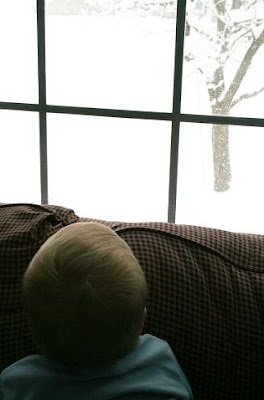 Your little boy looks so cozy on that couch looking out at the snow! And it looks like it's snowing HARD! Bet your little guy was pleased to be on the inside during the shot! They are sweet when they are just absorbing the world outside. Great capture. I love it! I have a little boy who loves to sit on the couch and watch the falling snow, too. What a very precious picture! Your first entry is a ringer!!! I love it! You wonder what he's thinking but you already know exactly what he's seeing. Nice job! I love it! Again, the shadowed child and the bright snow are a great contrast. Looks so familiar, almost like it could have been taken at my house! (I have a two year old son who does the same thing.) Love it!